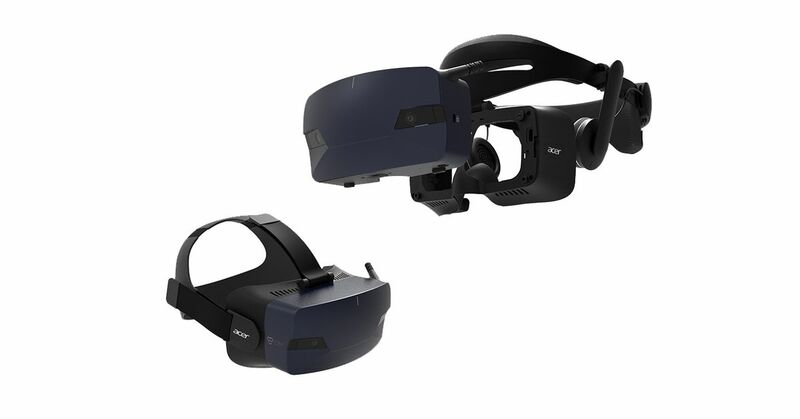 Acer presents today at the IFA in Berlin a new version of its Windows Mixed Reality headset. The Acer OJO 500 has a modular design with removable parts. It's designed for businesses like museums or attractions where customers can use the headset several times a day, and both the lens and the headband can be completely removed and cleaned. Acer supplies the OJO 500 with either a hard or soft headband and the soft version is machine washable. The mask on the headset can be reversed, so you do not have to remove the headset completely to check your environment. Acer also has an integrated pupil distance wheel (IPD) to adjust the distance between the display and the human eyes. This should make VR apps and games in Windows Mixed Reality a little clearer and sharper. With two 2.89-inch LCD displays (2880 x 1440), Acer improves its field of view by 100 degrees. While Samsung has integrated its own headphones into its mixed-reality headset, Acer has developed a "sound pipe" that allows users to hear audio without wearing headphones. There are also built-in headphones with the hard headband, if the spatial audio does not always penetrate enough. Acer's OJO 500 headset will be available in the US and Europe starting in November and will be available from $ 399.